Floor to Ceiling Books: Spec Fic Reading Challenge: June Review Link Up! 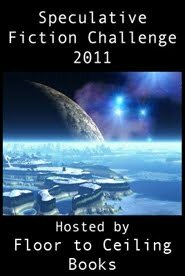 This is post where you can link up your reviews posted on your blogs in June 2011 to be in with a chance of winning the prize pack. The prize pack this month consists of: Cowboy Angels by Paul McAuley, Wolfsangel by M D Lachlan and The Lies of Locke Lamora by Scott Lynch. Good luck to you all, and I look forward to seeing your reviews for June! My thirteenth review for the challenge went up at Boomtron! Review posted of Douglas Hulick's debut novel, Among Thieves. It only took me 3 weeks, but I finally finished my review of Amy Kathleen Ryan's Glow. Now I find myself 4 reviews behind. Again. Review posted for Guy Gavriel Kay's early book Tigana. I'm at 10! SLOWLY GETTING THERE! Also, since it's the first book I read on an e-reader, I babble about e-readers too. Posted A Wizard of Mars by Diane Duane. I've lagged on the China Mieville I was reading . . . gah. Posted The Game of Thrones review. This makes 11. I would have more reviews but it was my goal to only count books I'd read for the first time, because part of why I signed up for this was to discover new writers. Also, I probably won't review the rest of the Game of Thrones books because they're too much the same . . . even if I'm addicted and cannot stop reading them. I linked up Friday's review of the Wise Man's Fear up! Final Review for the month: Feed by Mira Grant.